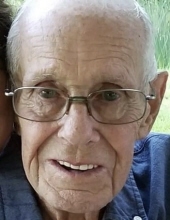 ANDERSON, Edward Elmer - Age 92, of Fenton, died Monday, April 8, 2019. Funeral Mass will be celebrated 11:00 AM Wednesday, April 10, 2019 at St. John the Evangelist Catholic Church, 600 N. Adelaide St, Fenton. Fr. David Harvey celebrant. Visitation will be held at Sharp Funeral Homes, 1000 Silver Lake Road, Fenton Tuesday from 5-8 PM where a Knights of Columbus Memorial Service will be held at 7:00 PM and Wednesday at the church from 10:00 AM until the time of the Mass. Those desiring may make contributions to the Salvation Army. Edward was born October 11, 1926 in Pittsburgh, PA, the son of Elmer and Edna (Ross) Anderson. He was a graduate of Muskegon High School and received a Bachelor's in Civil Engineering from Marquette University. He was a WWII veteran serving in the U.S. Navy. He married Barbara Chisholm September 30, 1957 in Hart, and she preceded him in death December 13, 2009. Edward owned and operated Allied Land Surveying for many years. He was a member of St. John the Evangelist Catholic Church and the Knight of Columbus Fenton Council #7418. He also was a life member of the Fenton V.F.W. Curtis Wolverton Post #3243. He enjoyed wood carving, painting, and playing the piano. Surviving are: his children, Janice (Lee) Solomon of Parkland, FL, Daniel (Cindy) Anderson of Howell, Melissa Willer of Harrison, Linda (Carl) Kiel of Byron Center, and Mary (Joseph) Gilmour of Grand Blanc; grandchildren, Jacob, Jessica, Edward, Rachel (John), Renae, Amanda (Ryan), Scott, Ryan, Nicholas (Ashley), Zachary, Tara (Brad), and Tonya (Ben); great grandchildren, Hunter, Brooklyn, Tyler, Tucker, Ava, Garrett, Graham, Andrew, David, Austin, Luke, Michael, and Charlotte; sister, Marie (Cliff) Buchfink of Arizona; and many nieces and nephews. He was also preceded in death by his son-in-law, Gary Willer and grandson, Jason Kiel. Tributes may be posted at www.sharpfuneralhomes.com. To send flowers or a remembrance gift to the family of Edward Elmer Anderson, please visit our Tribute Store. "Email Address" would like to share the life celebration of Edward Elmer Anderson. Click on the "link" to go to share a favorite memory or leave a condolence message for the family.